Out of the myriad archives, books and prints acquired by our founder, Mary Evans, since the library’s inception in 1964, that which brought her the most personal joy was arguably the Thomas Fall Collection which came to the library in 2001. The name Thomas Fall is synonymous with the highest quality photographs of pedigree dogs, and Mary’s interest in the archive, the oldest of its kind in the world, was not only professional but born of a lifelong love of canine companions. Thomas Fall was born in 1833 when the art, not to mention the science, of photography was in its infancy. In 1826 the first permanent, surviving photograph had been produced by Frenchman Joseph Nicéphore Niépce who later worked with Louis Daguerre, the inventor of the daguerreotype process in 1839 which produced unique but fragile images. Others swiftly followed, refining and developing processes to fix a photographic image. English pioneer Henry Fox Talbot had developed the calotype by 1840, producing a negative from which positive prints could be taken, while John Herschel made the first glass negative in 1839. Into this atmosphere of feverish invention, Thomas Fall took his first steps, setting up as a portrait photographer in the 1850s in Bedale in Yorkshire. In the late 1860s he moved to London to work for the established studio of Elliott and Fry in Baker Street, and from there founded his own business in 1875, also in Baker Street. He began to specialise in photographing dogs, perhaps because many of his high society patrons wished their pets immortalised quite as much as their other family members. During the 1890s he was commissioned by the Princess of Wales, later Queen Alexandra, to photograph her with her dogs earning the company a Royal Warrant. In 1900 Thomas Fall died, but this was far from the end of the story. In fact the company’s association with the art of photographing dogs was immeasurably strengthened and amplified by those who came after him. 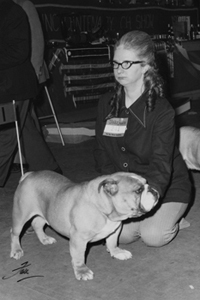 Edward Hitchings Parker died in 1958, with Barbara Bourn continuing the firm’s business of photographing pedigree dogs. By the late 1960s, she felt that things were coming to a natural conclusion but was persuaded by fellow photographer William Burrows, who she later married, of the historical worth of the pictures taken since the late 19th century. We are delighted that this flourishing archive is now part of the Mary Evans Picture Library, and has the opportunity of being widely seen by both dog and history lovers. Over nearly a century, Thomas Fall has been connected with the top kennels of the country, and the remarkable photographs taken in this time are a vital historical record of how breeds have changed. In addition, the images have a charm all of their own, the owners proud, the dogs elegant, noble or just plain cute.